Whitney P. Witt, Ph.D. M.P.H., Audrey J. Weiss, Ph.D., and Anne Elixhauser, Ph.D.
A variety of factors may explain the recent trends in children's hospitalizations, including changes in the conditions for which children are being treated. One recent study of children's inpatient stays in pediatric hospitals found that the number of patients, aggregate hospital charges, and number of hospital days grew more rapidly between 2004 and 2009 among children with chronic conditions than among those without chronic conditions.4 Children with multiple chronic conditions also were more likely to be covered by Medicaid than were those without a chronic condition.5 Understanding the reasons why children are hospitalized and examining trends over time is critical to inform clinical practice and health policy. This Healthcare Cost and Utilization Project (HCUP) Statistical Brief presents data on hospital inpatient stays among children aged 17 years and younger in 2012. Data were taken from the HCUP Kids' Inpatient Database (KID), which is created once every 3 years. The KID is the only database specifically developed to study hospitalizations among children. This Statistical Brief updates previously published information6,7 using the KID and examines trends over time. In this Statistical Brief, we present characteristics of hospital stays among children aged 0-17 years, in comparison to hospital stays among adults aged 18-44 years. The distribution of hospital stays and aggregate hospital costs by pediatric age group is provided. Trends in the distribution of stays among children by primary payer from 2000 to 2012 also are shown. Finally, the most common types of conditions and operating room (OR) procedures for hospital stays among children are presented. All differences between mean estimates noted in the text are statistically significant at the .001 level or better. Differences between proportions noted in the text differ by at least 10 percent. Table 1 presents characteristics of inpatient hospitalizations among children (aged 0-17 years) compared with adults (aged 18-44 years). In 2012 there were nearly 5.9 million hospital stays for children in the United States, of which 3.9 million were neonatal stays and 104,700 were maternal stays for pregnant teens. Between 2000 and 2012, the number of neonatal stays (births) fluctuated around 4.0 million stays, reaching a high of 4.3 million in 2006. Hospital stays for teen pregnancies decreased by 47 percent over the 12-year period. In 2012, Medicaid covered over half (51.6 percent) of nonneonatal and nonmaternal stays for children and about a quarter (26.4 percent) of stays for adults aged 18-44 years. In contrast, 2.7 percent of stays for children were uninsured compared with 16.9 percent of stays for adults aged 18-44 years. From 2000 to 2012, the proportion of hospital stays for children paid by Medicaid increased by 33 percent, and the proportion paid by private insurance decreased by 21 percent. For most conditions, the rate of hospitalization for children decreased or remained relatively unchanged from 2000 to 2012. Only skin conditions showed an increase in rate of hospitalization (35.6 percent). Substantial decreases in rates of hospitalization over the 12-year period were observed for HIV infection (89.9 percent) and substance abuse (60.1 percent). Respiratory diagnoses—pneumonia, acute bronchitis, and asthma; mood disorders; appendicitis; and epilepsy/ convulsions were the most common specific conditions for which children were hospitalized. In 2012 there were nearly 5.9 million hospital stays for children in the United States. In 2012, children aged 17 years and younger had 5.9 million hospital stays, and adults aged 18-44 years had 9.0 million stays. The rate of all hospital stays was similar for children and adults (7,928 and 7,888 stays per 100,000 population, respectively). Excluding neonatal and maternal stays, adults aged 18-44 years had a 1.7 times higher rate of hospitalization compared with children. More than two-thirds of hospital stays among children were for infants being born (neonatal stays) or teens giving birth (maternal stays). Neonatal and maternal stays constituted a substantial proportion of hospital stays among children (68.4 percent of all stays) as well as adults aged 18-44 years (45.1 percent of all stays). Among children's stays, 3.9 million were for infants being born and 104,700 were for maternal stays. Across all hospitalizations, mean hospital costs were lower for children than for adults; however, excluding newborn and maternal stays, mean hospital costs were higher for children. Across all hospitalizations, children had lower mean hospital costs ($6,415) compared with adults aged 18-44 years ($7,612). However, when neonatal and maternal stays were excluded, children had higher mean hospital costs ($11,143) than did adults ($10,214). Notably, hospital costs were substantially higher among both age groups when neonatal and maternal stays were excluded: children (1.74 times higher) and adult (1.34 times higher). Over half of nonneonatal and nonmaternal hospital stays among children were covered by Medicaid, compared with about one-fourth of stays among adults aged 18-44 years. Among nonneonatal and nonmaternal hospitalizations, Medicaid covered over half (51.6 percent) of stays for children and just over one-fourth (26.4 percent) of stays for adults aged 18-44 years. Hospital stays among children were less likely to be uninsured than hospital stays among adults. Across all hospitalizations, 3.5 percent of stays for children were not covered by insurance compared with 10.5 percent of stays for adults aged 18-44 years. For nonneonatal and nonmaternal hospitalizations, 2.7 percent of stays for children were uninsured compared with 16.9 percent of stays for adults aged 18-44 years. 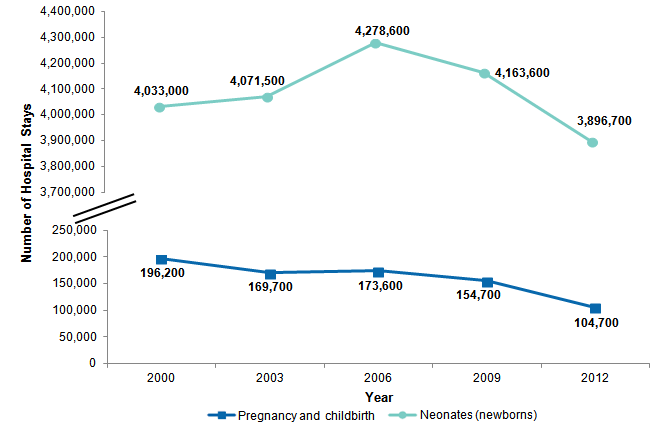 Figure 1 shows the number of hospital stays for neonates (newborns) and for pregnancy and childbirth among teenagers for the 2000-2012 time period. Figure 1. Neonatal and maternal hospital stays among children aged 0-17 years, 2000-2012. Figure 1 is a line graph that shows the number of hospital stays for pregnancy and childbirth and for neonates between 2000 and 2012, in 3-year increments. The number of hospital stays for pregnancy and childbirth was 196,200 in 2000. By 2003, it had decreased to 169,700, and it increased slightly to 173,600 in 2006. There was a steady decrease to 104,700 between 2006 and 2012. The number of hospital stays for neonates was 4,033,000 in 2000. It increased to 4,071,600 in 2003 and increased sharply to 4,278,600 in 2006. After that it declined steadily, reaching 3,896,700 in 2012. Maternal stays for teenagers dropped significantly between 2000 and 2012. The number of teen hospital stays for pregnancy, delivery, and postdelivery care decreased from 196,200 in 2000 to 104,700 in 2012—a 47 percent decline over the 12-year time period. The number of neonatal stays—births and newborn care—fluctuated during the same time period. Neonatal hospital stays fluctuated around 4 million between 2000 and 2012, increasing somewhat from 4.0 million in 2000 to 4.3 million in 2006 and then decreasing somewhat to 3.9 million in 2012. Figure 2 shows total hospital stays and aggregate hospital costs among children for different age groups in 2012. Figure 2. Hospital inpatient stays and aggregate hospital costs among children aged 0-17 years by age group, 2012. Figure 2 is a bar chart that shows the percentage of hospital stays and the percentage of hospital costs for infants and children aged 0-17 years in 2012. Of the 5,850,200 hospital stays for children in 2012, 73.0% were for newborns and infants under 1 year, 8.2% were for children between 1 and 4 years of age, 5.5% were for children between 5 and 9 years of age, 6.1% were for children between 10 and 14 years of age, and 7.1% were for children between 15 and 17 years of age. Of the $37,400,000 in aggregate hospital costs for stays for children in 2012, 57.9% were for newborns and infants under 1 year, 11.5% were for children between 1 and 4 years of age, 8.6% were for children between 5 and 9 years of age, 11.2% were for children between 10 and 14 years of age, and 10.9% were for children between 15 and 17 years of age. Nearly three-fourths of hospital stays for children and more than half of all hospital costs for children were for newborns and infants. Newborns and infants younger than 1 year of age constituted 73.0 percent of all hospital stays for children and 57.9 percent of aggregate hospital costs. Hospital stays and aggregate hospital costs were fairly equally distributed among other pediatric age groups. Figure 3 examines primary payer for hospital stays among children compared with adults from 2000 to 2012. Note: Hospital stays for children and adults (aged 18-44 years) who were covered by Medicare, were covered by other types of insurance, or were missing primary payer information were excluded from this figure, and thus percentages do not total 100. Figure 3. Hospital inpatient stays among children aged 0-17 years versus adults aged 18-44 years by expected primary payer, 2000-2012. Figure 3 is made up of two line graphs—one for children and one for adults—that show the percentage of stays that were uninsured or were covered by Medicaid or private insurance between 2000 and 2012. For children 0-17 years, the percentage of stays that were uninsured was 4.9% in 2000, and except for a slight increase in 2006, the percentage of stays that were uninsured decreased steadily to 3.5% in 2012. For children 0-17 years, the percentage of stays covered by Medicaid increased steadily from 36.5% in 2000 to 48.6% in 2012. For children 0-17 years, the percentage of stays covered by private insurance decreased steadily from 55.1% in 2000 to 43.6% in 2012. For adults 18-44 years, the percentage of stays that were uninsured was 9.1% in 2000, decreased slightly between 2000 and 2003, increased slightly between 2003 and 2009, and then decreased slightly to 10.5% in 2012. For adults 18-44 years, the percentage of stays that were covered by Medicaid increased steadily from 25.6% in 2000 to 34.4% in 2012. For adults 18-44 years, the percentage of stays that were covered by private insurance decreased steadily from 54.6% in 2000 to 42.9% in 2012. Note: Hospital stays for children and adults (aged 18-44 years) who were covered by Medicare, were covered by other types of insurance, or were missing primary payer information were excluded from this figure, and thus percentages do not total 100. The proportion of hospital stays for children covered by Medicaid has increased over time, and the proportion covered by private insurance has decreased. Medicaid now pays for nearly half of all hospitalizations for children. The proportion of hospital stays for children that were covered by Medicaid increased from 36.5 percent in 2000 to 48.6 percent in 2012, a 33 percent increase. At the same time, the proportion of hospital stays for children covered by private insurance decreased 21 percent from 55.1 percent in 2000 to 43.6 percent in 2012. A similar shift occurred among adults aged 18-44 years, although private insurance continued to pay for more stays than Medicaid in 2012. Between 2000 and 2012, the proportion of adult hospital stays covered by Medicaid increased from 25.6 to 34.4 percent, a 34 percent increase, and the proportion covered by private insurance decreased from 54.6 to 42.9 percent, a 21 percent decrease. During this same time period, the proportion of stays that were uninsured decreased from 4.9 to 3.5 percent among children and increased from 9.1 to 10.5 percent among adults aged 18-44 years. Figure 4 shows the 10 most common major diagnostic categories (MDCs), excluding newborns, for hospital inpatient stays among children in 2012. Note: This figure includes all hospital stays but excludes MDC code 15, corresponding to Newborns and other neonates with condtn orig in perinatal period, for which there were 3.9 million total hospital stays. Figure 4. Top 10 major diagnostic categories (MDCs), excluding newborns, for hospital stays among children aged 0-17 years, 2012. Figure 4 is a bar chart that shows in descending order of number of stays, the diagnostic categories for which children aged 0-17 excluding newborns were hospitalized in 2012. There were 438,000 stays for respiratory system; 234,000 stays for digestive system; 164,000 stays for nervous system; 154,000 stays for mental diseases and disorders; 119,000 stays for musculoskeletal system and connective tissue; 106,000 stays for endocrine, nutritional, and metabolic system; 105,000 stays for pregnancy, childbirth, and puerperium; 104,000 stays for ear, nose, mouth, and throat; and 79,000 stays for skin, subcutaneous tissue, and breast. Note: This figure includes all hospital stays but excludes MDC code 15, corresponding to Newborns and other neonates with condtn orig in perinatal period, for which there were 3.9 million total hospital stays. Figure 5. Change in rates of major diagnostic categories (MDCs) for hospital stays among children aged 0-17 years, 2000-2012. Hospital stays among children most commonly involved the respiratory or digestive system. In 2012, excluding newborns, respiratory conditions were the most frequent reason for hospitalization among children, accounting for 438,000 hospitalizations, or 22 percent of all nonneonatal hospital stays. Digestive conditions were the second most common overall reason for pediatric hospitalization, accounting for 234,000 hospitalizations (12 percent of nonneonatal stays). Nervous system conditions ranked third, with 164,000 hospital stays, and mental disorders ranked fourth at 154,000 stays. 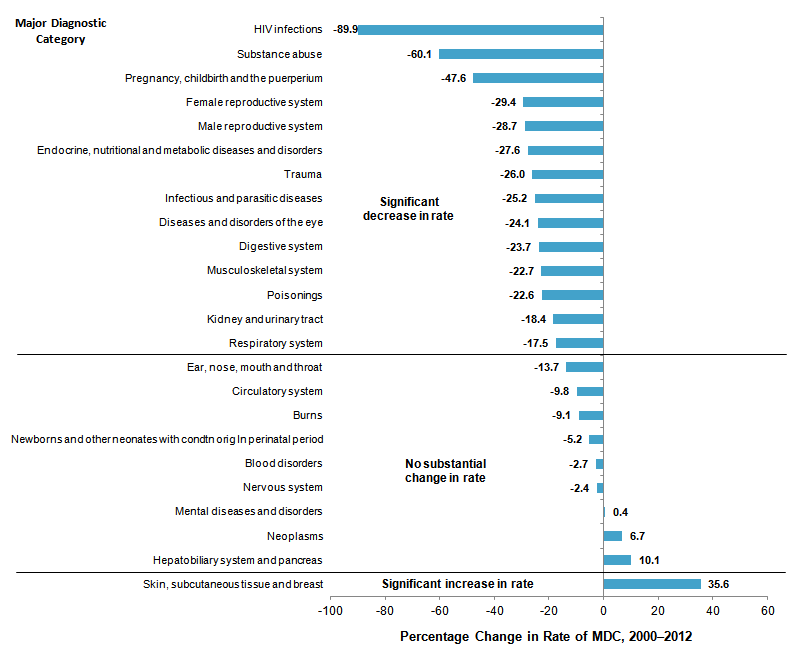 The percentage change in rates of hospital stays for major diagnostic categories (MDCs) among children between 2000 and 2012 is shown in Figure 5. Figure5 is a bar chart that shows, in descending order starting with the largest decline, the change in rates of hospital stays between 2000 and 2012 for 24 major diagnostic categories. Among the rates that declined significantly, the rate of hospital stays for HIV infections declined by 89.9%; for substance abuse the rate declined by 60.1%; for pregnancy, childbirth and the puerperium the rate decined by 47.6%; for female reproductive system the rate declined by 29.4%; for male reproductive system the rate declined by 28.7%; for endocrine, nutritional and metabolic diseases and disorders the rate declined by 27.6%; for trauma the rate declined by 26.0%; for infectious and parasitic diseases the rate declined by 25.2%; for diseases and disorders of the eye the rate declined by 24.1%; for digestive system the rate declined by 23.7%; for musculoskeletal system the rate declined by 22.7%; for poisonings the rate declined by 22.6%; for kidney and urinary tract the rate declined by 18.4%; and for respiratory system the rate declined by 17.5%. There was no substantial change in the rate of hospital stays for nine diagnostic categories: for ear, nose, mouth and throat the rate declined by 13.7%; for circulatory system the rate declined by 9.8%; for burns the rate declined by 9.1%; for newborns and other neonates with condition originating in perinatal period the rate declined by 5.2%; for blood disorders the rate declined by 2.7%; for nervous system the rate declined by 2.4%; for mental disease and disorders the rate increased by 0.4%; for neoplasms the rate increased by 6.7%; and for hepatobiliary system and pancreas the rate increased by 10.1%. There was a significant increase of 35.6% in the rate for skin, subcutaneous tissue and breast. Note: MDCs with a change in rate of at least 15 percent between 2000 and 2012 were significantly different at the p<.001 level. For most major diagnostic categories, the rate of hospitalization for children decreased over time or remained relatively unchanged between 2000 and 2012. Of the 24 MDCs among children aged 0-17 years, 14 had a significant decrease in the rate of stays per 100,000 population between 2000 and 2012, 9 showed no substantial change in rate, and 1 showed a significant increase in rate. The most substantial decreases were for HIV infections (89.9 percent decrease in rate), substance abuse (60.1 percent decrease), and pregnancy and childbirth (47.6 percent decrease). Conditions of the skin and subcutaneous tissue increased over time for children. Only skin conditions showed a significant increase in rate between 2000 and 2012 (35.6 percent increase). Table 2 expands on the findings by MDC by presenting the 10 most common principal diagnoses for nonneonatal and nonmaternal stays among children compared with adults in 2012. Note: This table is limited to nonmaternal and nonneonatal stays in the child and adult populations. Principal diagnosis is identified using Clinical Classifications Software (CCS) diagnosis categories. Respiratory conditions were the most frequent reasons for hospital stays among children. Consistent with Figure 4, three respiratory conditions—pneumonia, acute bronchitis, and asthma—were the three top specific reasons for hospitalization among children in 2012, each accounting for over 120,000 hospital stays for children. Each of the three respiratory conditions occurred at a rate of 165 to 170 stays per 100,000 population. Respiratory conditions were not among the 10 most common diagnoses for hospitalized nonmaternal adults aged 18-44 years. Mental illness was among the most common reasons for hospitalization among children, but mental illness was a more common diagnosis among adults. The fourth most common reason for hospitalization among children (excluding neonatal and maternal stays) was mood disorders—144.4 stays per 100,000 population. However, among nonmaternal adults aged 18-44 years, 3 of the top 10 most frequent reasons for hospitalization were mental illness and substance abuse disorders: mood disorders ranked first (362.0 stays per 100,000 population); schizophrenia ranked second (167.2 stays per 100,000 population); and substance-related disorders ranked seventh (106.1 stays per 100,000 population). Appendicitis was among the most common reasons for hospital stays among both children and adults. Figure 4 showed that the second ranked major diagnostic category was digestive conditions. The specific digestive condition in the top 10 was appendicitis—the fifth most common reason for hospitalization among children (97.4 stays per 100,000 population). Appendicitis was the ninth most common reason for hospital stays among adults aged 18-44 years (91.7 stays per 100,000 population). Epilepsy was ranked as the sixth most common reason for hospitalization among children. Figure 4 showed that the third most common major diagnostic category for hospitalized children was nervous system disorders—that result is reflected in the ranking of epilepsy and seizures as the sixth most common specific condition among hospitalized children, with 94.7 stays per 100,000 population. Infections, chemotherapy, and fluid/electrolyte disorders were other top 10 specific reasons for hospitalization among children. Other top 10 conditions among nonmaternal and nonneonatal stays for children were skin and subcutaneous tissue infections (ranked seventh), fluid and electrolyte disorders (ranked eighth), maintenance chemotherapy (ranked ninth), and urinary tract infections (ranked tenth). Table 3 presents the 10 most common operating room (OR) procedures among children in 2012. Note: All-listed OR procedures are identified using Clinical Classifications Software (CCS) procedure categories. Procedures designated as "Other" are not reported; these represent miscellaneous procedures that may be difficult to interpret as a group. Circumcision was the most frequent OR procedure among hospitalized children in 2012. By far, the most frequent OR procedure performed during pediatric hospital stays was circumcision, which was performed in over 1 million hospital stays in 2012 at a rate of 1,440.8 per 100,000 population. The second most common OR procedure performed on children was appendectomy, with 76,200 stays in 2012 at a rate of 103.3 stays per 100,000 population. Notably, the third most common OR procedure among children was Cesarean section, occurring during 18,300 hospital stays at a rate of 24.8 stays per 100,000 population. All other OR procedures occurred in fewer than 20,000 hospital stays and at a rate of fewer than 21 stays per 100,000 population. This analysis was limited to pediatric discharges from the KID for children aged 0-17 years and adult discharges from the NIS for adults aged 18-44 years. All-listed procedures were limited to surgical stays with "valid OR procedures" based on DRG coding principles. CCS categorizes ICD-9-CM diagnoses and procedures into a manageable number of clinically meaningful categories.10 This clinical grouper makes it easier to quickly understand patterns of diagnoses and procedure use. CCS categories identified as "Other" typically are not reported; these categories include miscellaneous, otherwise unclassifiable diagnoses and procedures that may be difficult to interpret as a group. For this report, major operating room (OR) procedures were defined using procedure classes, which categorize each ICD-9-CM procedure code as either major therapeutic, major diagnostic, minor therapeutic, or minor diagnostic.11 Major OR procedures are considered to be valid OR procedures based on DRGs. This classification scheme relies on physician panels that classify ICD-9-CM procedure codes according to whether the procedure would be performed in a hospital OR in most hospitals. Major OR procedures were identified using all procedure fields (first-listed and secondary) that were available on the discharge record. MDCs are derived from the DRG reimbursement system. A patient's hospital record is assigned a single MDC that designates the body system (e.g., respiratory system) or etiology (e.g., trauma) of the principal diagnosis for that hospital stay. The Kids' Inpatient Database (KID) and the National (Nationwide) Inpatient Sample (NIS) are based on data from community hospitals, which are defined as short-term, non-Federal, general, and other hospitals, excluding hospital units of other institutions (e.g., prisons). The KID and NIS include obstetrics and gynecology, otolaryngology, orthopedic, cancer, pediatric, public, and academic medical hospitals. Excluded are long-term care facilities such as rehabilitation, psychiatric, and alcoholism and chemical dependency hospitals. Beginning in 2012, long-term acute care hospitals are also excluded from the NIS. However, if a patient received long-term care, rehabilitation, or treatment for psychiatric or chemical dependency conditions in a community hospital, the discharge record for that stay will be included in the KID or NIS. Total hospital charges were converted to costs using HCUP Cost-to-Charge Ratios based on hospital accounting reports from the Centers for Medicare & Medicaid Services (CMS). Costs reflect the actual expenses incurred in the production of hospital services, such as wages, supplies, and utility costs; charges represent the amount a hospital billed for the case. For each hospital, a hospital-wide cost-to-charge ratio is used. Hospital charges reflect the amount the hospital billed for the entire hospital stay and do not include professional (physician) fees. For the purposes of this Statistical Brief, costs are reported to the nearest hundred. The Healthcare Cost and Utilization Project (HCUP, pronounced "H-Cup") is a family of health care databases and related software tools and products developed through a Federal-State-Industry partnership and sponsored by the Agency for Healthcare Research and Quality (AHRQ). HCUP databases bring together the data collection efforts of State data organizations, hospital associations, and private data organizations and the Federal government to create a national information resource of encounter-level health care data (HCUP Partners). HCUP includes the largest collection of longitudinal hospital care data in the United States, with all-payer, encounter-level information beginning in 1988. These databases enable research on a broad range of health policy issues, including cost and quality of health services, medical practice patterns, access to health care programs, and outcomes of treatments at the national, State, and local market levels. The HCUP Kids' Inpatient Database (KID) is a nationwide database of hospital inpatient stays. The KID is the only dataset on hospital use, outcomes, and charges designed to study children's use of hospital services in the United States. The KID is a sample of discharges from all community, nonrehabilitation hospitals in States participating in HCUP. For the 1997 KID, hospital discharges for patients aged 18 years or younger were included in the database. Pediatric discharges are defined as all discharges where the patient was aged 20 years or younger at admission. The KID's large sample size enables analyses of rare conditions (such as congenital anomalies) and uncommon treatments (such as organ transplantation). It can be used to study a wide range of topics including the economic burden of pediatric conditions, access to services, quality of care and patient safety, and the impact of health policy changes. The KID is produced every 3 years; prior databases are available for 1997, 2000, 2003, 2006, 2009, and 2012. Agency for Healthcare Research and Quality. Overview of the Kids' Inpatient Database (KID). Healthcare Cost and Utilization Project (HCUP). Rockville, MD: Agency for Healthcare Research and Quality. Updated August 2014. http://www.hcup-us.ahrq.gov/kidoverview.jsp. Accessed September 11, 2014. Witt WP (Truven Health Analytics), Weiss AJ (Truven Health Analytics), Elixhauser A (AHRQ). 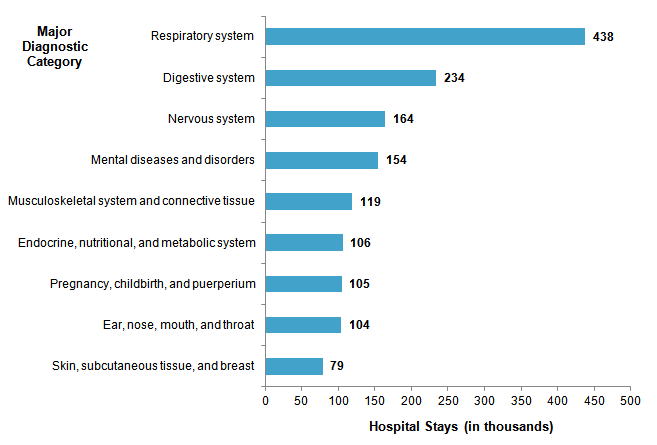 Overview of Hospital Stays for Children in the United States, 2012. HCUP Statistical Brief #187. December 2014. Agency for Healthcare Research and Quality, Rockville, MD. http://www.hcup-us.ahrq.gov/reports/statbriefs/sb187-Hospital-Stays-Children-2012.pdf. 1 Weiss AJ, Elixhauser A. Overview of Hospital Stays in the United States, 2012. HCUP Statistical Brief #180. October 2014. Agency for Healthcare Research and Quality, Rockville, MD. http://www.hcup-us.ahrq.gov/reports/statbriefs/sb180-Hospitalizations-United-States-2012.pdf. Accessed October 10, 2014. 2 Moore B, Levit K, Elixhauser A. 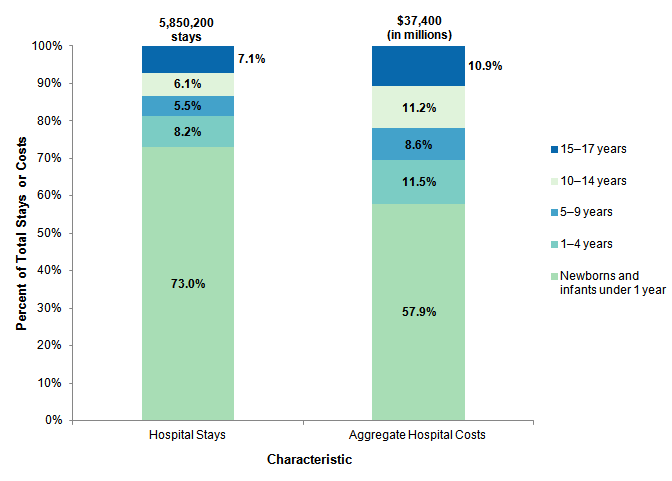 Costs for Hospital Stays in the United States, 2012. HCUP Statistical Brief #181. October 2014. Agency for Healthcare Research and Quality, Rockville, MD. http://www.hcup-us.ahrq.gov/reports/statbriefs/sb181-Hospital-Costs-United-States-2012.pdf. Accessed October 27, 2014. 4 Berry JG, Hall M, Hall DE, et al. Inpatient growth and resource use in 28 children's hospitals. JAMA Pediatrics. 2013;167(2):170-7. 6 Elixhauser A. Hospital Stays for Children, 2006. HCUP Statistical Brief #56. July 2008. Agency for Healthcare Research and Quality. Rockville, MD. http://www.hcup-us.ahrq.gov/reports/statbriefs/sb56.pdf. Accessed November 3, 2014. 7 Yu, H, Wier LM, Elixhauser A. Hospital Stays for Children, 2009. HCUP Statistical Brief #118. August 2001. Agency for Healthcare Research and Quality. Rockville, MD. http://www.hcup-us.ahrq.gov/reports/statbriefs/sb118.pdf. Accessed November 3, 2014. 8 Agency for Healthcare Research and Quality. HCUPnet web site. http://hcupnet.ahrq.gov/. Accessed September 11, 2014. 9 Barrett M, Lopez-Gonzalez L, Coffey R, Levit K. Population Denominator Data for Use with the HCUP Databases (Updated with 2013 Population Data). HCUP Methods Series Report #2014-02. August 18, 2014. U.S. Agency for Healthcare Research and Quality. http://www.hcup-us.ahrq.gov/reports/methods/2014-02.pdf. Accessed September 11, 2014. 10 Agency for Healthcare Research and Quality. HCUP Clinical Classifications Software (CCS). Healthcare Cost and Utilization Project (HCUP). Rockville, MD: Agency for Healthcare Research and Quality, Rockville, MD. Updated July 2014. http://www.hcup-us.ahrq.gov/toolssoftware/ccs/ccs.jsp. Accessed September 11, 2014. 11 Agency for Healthcare Research and Quality. HCUP Procedure Classes. Healthcare Cost and Utilization Project (HCUP). Rockville, MD: Agency for Healthcare Research and Quality. Updated March 2014. http://www.hcup-us.ahrq.gov/toolssoftware/procedure/procedure.jsp. Accessed September 30, 2014. 12 Agency for Healthcare Research and Quality. HCUP Cost-to-Charge Ratio (CCR) Files. Healthcare Cost and Utilization Project (HCUP). 2001-2011. Rockville, MD: Agency for Healthcare Research and Quality, Rockville, MD. Updated August 2014. http://www.hcup-us.ahrq.gov/db/state/costtocharge.jsp. Accessed September 11, 2014. 13 For additional information about the NHEA, see Centers for Medicare & Medicaid Services (CMS). National Health Expenditure Data. Updated May 2014. http://www.cms.gov/Research-Statistics-Data-and-Systems/Statistics-Trends-and-Reports/NationalHealthExpendData/index.html?redirect=/NationalHealthExpendData/. Accessed October 9, 2014. 14 American Hospital Association. TrendWatch Chartbook, 2014: Trends Affecting Hospitals and Health Systems. Table 4.2. Distribution of Inpatient vs. Outpatient Revenues, 1992-2012. Washington, DC: American Hospital Association. http://www.aha.org/research/reports/tw/chartbook/2014/table4-2.pdf. Accessed October 9, 2014. Internet Citation: Statistical Brief #187. Healthcare Cost and Utilization Project (HCUP). May 2016. Agency for Healthcare Research and Quality, Rockville, MD. www.hcup-us.ahrq.gov/reports/statbriefs/sb187-Hospital-Stays-Children-2012.jsp.